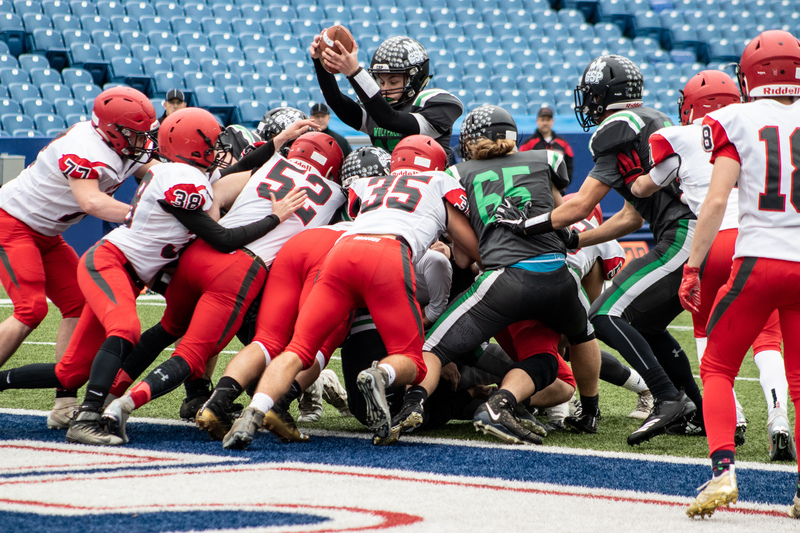 After holding a slim, one-touchdown lead, Allderdice held a fourth down attempt at their own four yard line. And then marched 96 yards to score and double their lead. Westinghouse finally got on the board late in the game to break the goose egg. 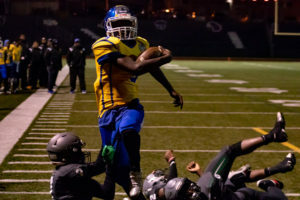 Despite the loss, Westinghouse would go on to play Somerset in the next round of the state playoffs and win. Thursday, then, was a long drive north to Orchard Park and New Era Field for five games of the NYSPHSAA Section 6 Finals. In New York, the New York State Public High School Athletic Association is the state organization that administers interscholastic athletics. Despite its name, it does allow some private schools to join. However, in the Buffalo area, the private schools are members of the independent Monsignor Martin Athletic Association. These might be schools you’re familiar with: Canisius, Bishop Timon, St. Joe’s, and St. Francis. Regular opponents of teams like Cathedral Prep, McDowell or now, Erie. Across the state, the New York Catholic High School Football League runs the sports in NYC metropolitan area. Now, despite the NYSPHSAA being the state association, not all of the state public schools are members. The Public School Athletic League that covers NYC schools, are not members. However, the rest of Long Island are members of the NYSPHSAA. As far as football is concerned, however, they do not participate in the state playoffs. They instead compete for the Long Island Championships. And until recently, the Buffalo City Schools also weren’t members of the NYSPHSAA. They, instead, had competed for the “Harvard Cup” among themselves. Only joining Section 6 less than a decade ago. Just as the NYSPHSAA has public schools not members, similar to PIAA for years not having Philadelphia schools, they also break the state up into geographical Sections, similar to PIAA Districts. These vary in size and number of teams. Starting just north of NYC, they are numbered 1 through 11. Syracuse is Section 3, the Binghamton area is Section 4, Rochester is Section 5, and the far western edge of the state is Section 6. Then 7 is northern New York, and Section 8 is western Long Island. Then, at some point, Section 9 was added to the west side of the Hudson river, and Section 10 was created along the northern border. And lastly, Long Island was split into two, essentially along county lines between Nassau and Suffolk, to create Section 11. Eight and 11, therefore, do not play state playoffs. For Sections 3, 4, 5, and 6, the number of teams and playoff structure are rather uniform. After a 7 game season*, there’s three rounds of playoffs among eight teams to determine a section champion. Then, the “Far West Regional” between Section 5 and 6 are matched up against the winners of 3 and 4. The eastern part of the state is more compact with sections of varying size and numbers, making playoffs far less uniform. As for Section 6, now, Class AA (largest) and D (smallest) have an 8-game schedule due to small numbers, and a truncated, four-team playoff. Class D only has four teams, and all four play a double-round robin and then hold a semifinal round before the Sectional Finals. 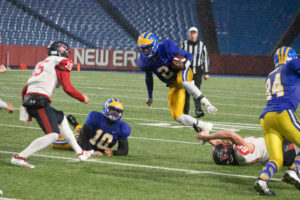 For Section 6, the finals are held at New Era Field, and have been done so since 1998. All five classifications now are held over two days. Previously playing all five in one day. And for a time there was a makeshift Class DD that played for two years before Class D began shrinking due to more and more co-ops among the smaller schools. Tickets are $10 per day, and in recent times have been played two games the first day, and three games the second. Because of the Bills hosting a game on Sunday, the games are usually moved back to Thursday and Friday, instead of Friday and Saturday. Just as District 7 (WPIAL) in PA have the goal of making it to Heinz, so too do the teams of Section 6 have of making the Ralph, or now the New Era. And one new team was making their first trip: Clymer/Sherman/Panama. On Thursday, though, at 5:30 in a light rain, the games began. Cleveland Hill and Southwestern set the tone with the highest scoring game of the weekend. A back and forth struggle that seemed like the last team to have the ball would win. Southwestern were the underdogs, but were definitely punching above their weight. Southwestern held a 28-26 lead after 3, before Cleveland Hill scored the winning TD on a 7 yard run in the fourth, 32-28. The night game, which the weather had intensified with a driving rain and stiff wind, was between neighborhood rivals, West Seneca West and West Seneca East. The WSW Indians being defending state championship. 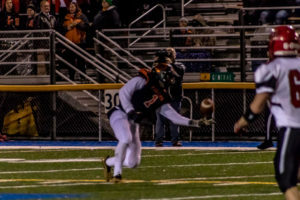 However, despite the regular season matchup going against them, the WSE Trojans scored late to break a 13-13 tie and hang on for the 20-13 victory. 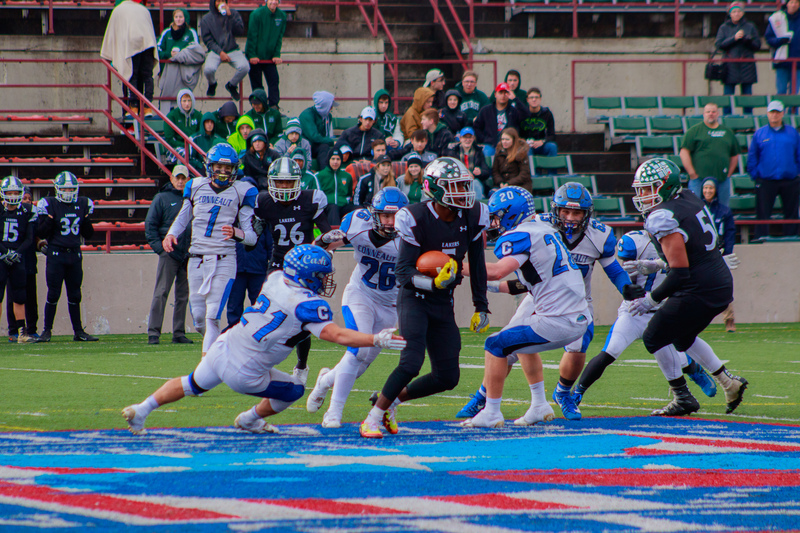 The next day was nicer weather with a 2:30pm kickoff for the Class D final. Pitting long-time and perennial contender Maple Grove against a recently created co-op of Clymer/Sherman/Panama. Both Clymer and Panama had been there previously. And Clymer/Sherman had played as a co-op for some time as well. But this was only the third year of the CSP Wolfpack. 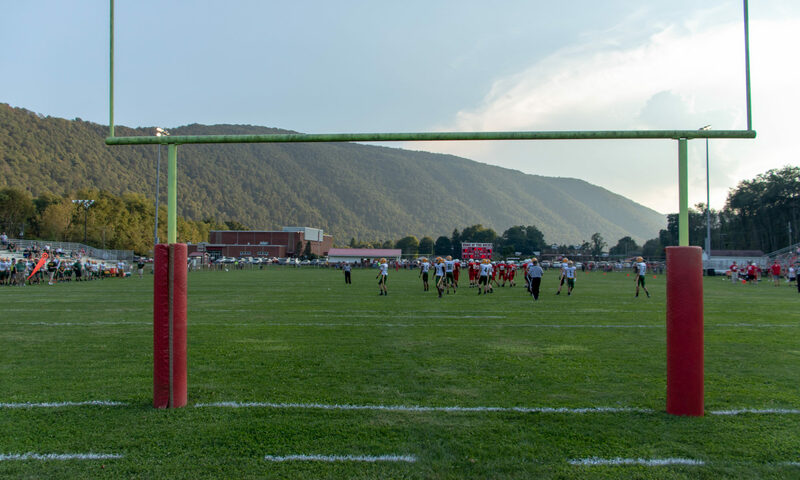 The three far southwestern schools in New York coming together to save football. They were undefeated and ranked #1 in the state. Maple Grove made it tight through the first half, only trailing 13-7. However, CSP’s dogged determination pulled through with three more second half touchdowns to salt the game away. CSP moves onto the state intersectional playoffs for the first time ever after beating rival Maple Grove, 35-7. The biggest teams then came out between Buffalo City Schools representative Bennett/Olmsted Tigers and eastern suburban school, Lancaster Legends. 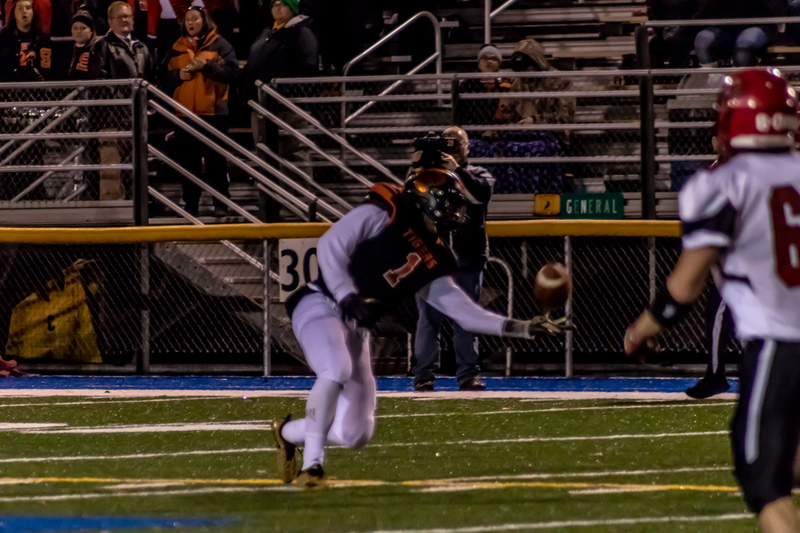 Bennett’s speed and athleticism looked to be a mismatch for Lancaster, as Bennett opened with an easy 90-yard TD run down the sideline. However, that’s all the points they could muster as critical mistakes doomed scoring chances, and Lancaster chugged out a 17-6 victory. The night cap then, was between Pioneer, from Yorkshire far southeast of Buffalo, and Cheektowaga, just a few minutes north of the stadium. Yorkshire led, 7-0 for much of the game, until the fourth quarter when the Cheektowaga Warriors scored on a 1-yard run early in the fourth. A two-point conversion made it 8-7. A sliver of a lead that the Warriors held until about 4 minutes left. When they scored once again, on a 13-yard TD run. Failing the conversion, the Pioneer Panthers had 3:32 left to try and tie or win the game. But the two-time Section 6 champions would successfully defend their title. All games at Clarence High School. 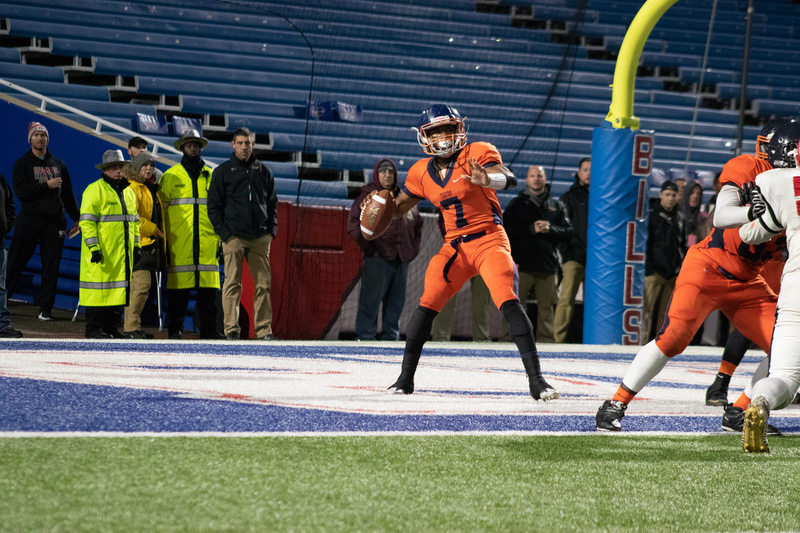 After a night in Orchard Park, it was on to Pennsylvania for two District 10 games. 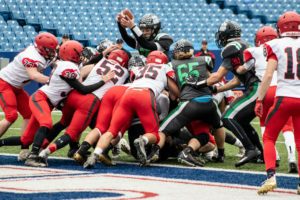 First up, was the Class 3A Quarterfinal between Mercyhurst Prep and Conneaut. 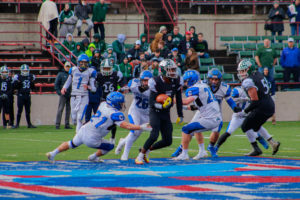 Despite an early miscue leading to a TD by the Conneaut Eagles, the Mercyhurst Prep Lakers put on a clinic. Methodically scoring again and again throughout the game. 8-8 after 1. 28-8 at the half. After that game, it was a short drive south to Greenville, a place I know quite well, for a Battle of the Tigers. Sharon would lead, 35-14 at the half. On the hands of this one-handed catch that took a decent lead and blew it wide open. And it didn’t stop there. Sharon tacked on two more in the next twelve minutes. 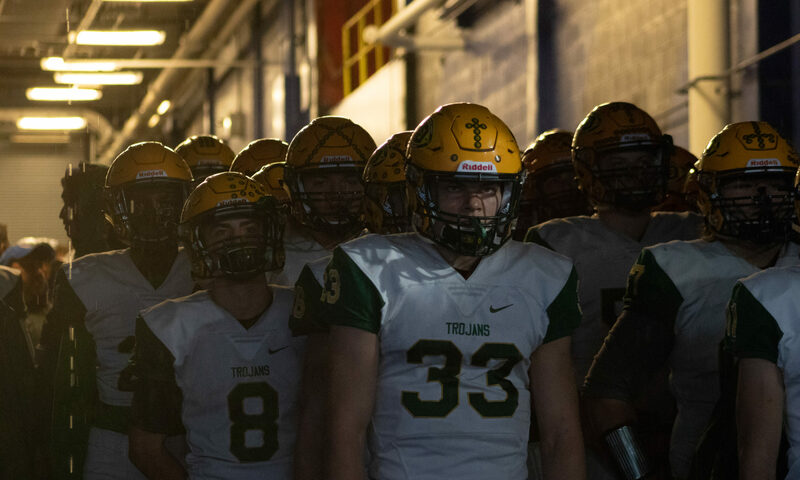 Before finally finishing with a 56-21 victory and ended the day setting up a matchup against Mercyhurst Prep in the 3A Semifinal. One of the better matchup projections of the upcoming weekend. As for my year, I added four new teams (Lancaster, Pioneer, Mercyhurst Prep, and Fairview), while 2018 now has 12 more different teams. And three new different stadiums AND two new different cities. Painstakingly close to my 1,000th different football team. I’ll have those two teams at 9am on Thursday. And will hit 900 games by Saturday if all goes well. For photos from this weekend’s games, click HERE. Westinghouse gets on the board. Cleveland Hill gets over the Hill. 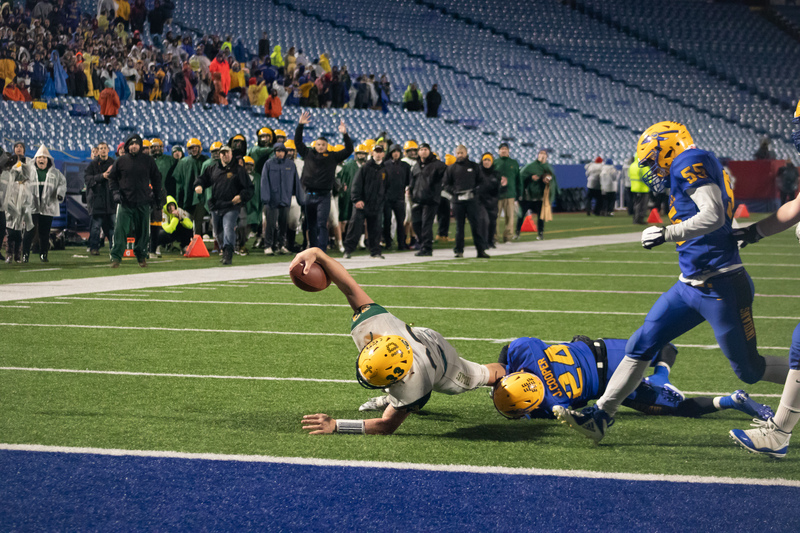 West Seneca East overcomes their state-champion-defending-rivals. CSP wins their first Section Championship. And does so convincingly. Bennett had the speed, and had the skill, but couldn’t put it all together like Lancaster could. Falling to the Legends. 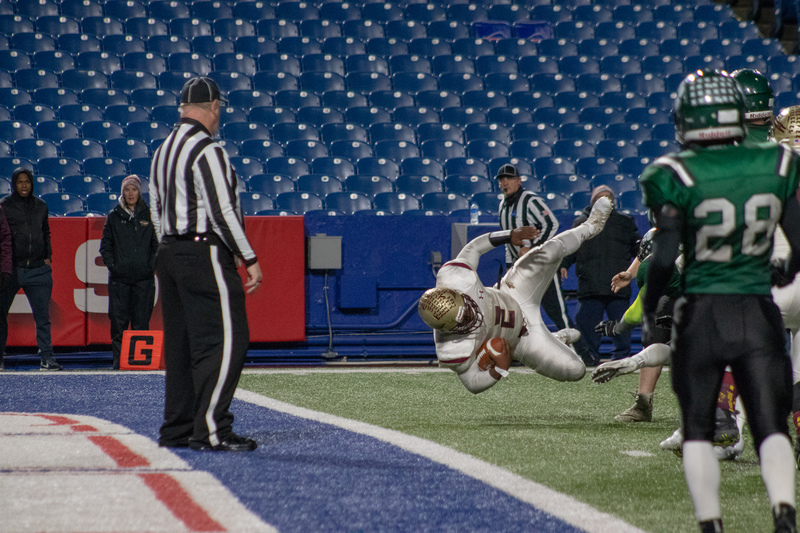 Cheektowaga canonballs into the endzone. Mercyhurst Prep runs away with a once-close game to setup a 2017 rematch with Sharon in the Semifinals. Sharon snags a one-handed victory from a fiesty Fairview team struggling to improve on the regular season outcome of the same matchup.